Since the pioneering work by Julius Adler in the 1960’s, bacterial chemotaxis has been predominantly studied as metabolism-independent. All available simulation models of bacterial chemotaxis endorse this assumption. Recent studies have shown, however, that many metabolism-dependent chemotactic patterns occur in bacteria. We present the simplest artificial protocell model capable of performing metabolism-based chemotaxis. The model serves as a proof of concept to show how even the simplest metabolism can sustain chemotactic patterns of varying sophistication. It also reproduces a set of phenomena that have recently attracted attention on bacterial chemotaxis and provides insights about alternative mechanisms that could instantiate them. 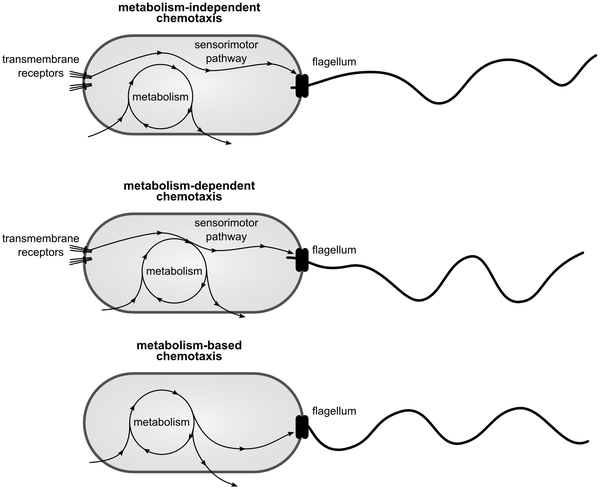 We conclude that relaxing the metabolism-independent assumption provides important theoretical advances, forces us to rethink some established pre-conceptions and may help us better understand unexplored and poorly understood aspects of bacterial chemotaxis. Left: Diagram indicating the minimal metabolic reaction and its coupling to tumbling and running modes of behaviour. A simple metabolism consumes resources M and E, which are then engaged in the autocatalytic production of C (a metabolic product) and W (waste). The concentration of C gives an indication of the “health” of the bacterium and is used to modulate the probability of switching between the running and tumbling modes. Egbert, M., Barandiaran, X. and Di Paolo, E. A. (2010). A minimal model of metabolism-based chemotaxis, PLoS Computational Biology, 6(12): e1001004. doi:10.1371/journal.pcbi.1001004. 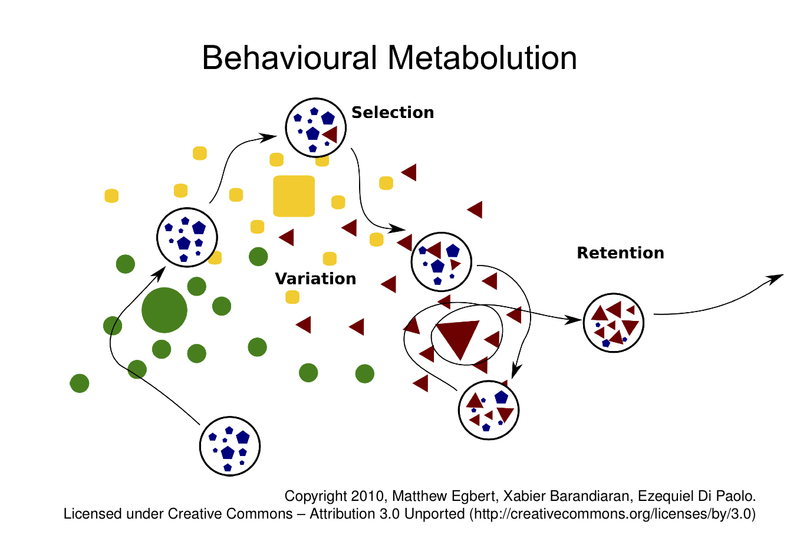 We use a minimal model of metabolism-based chemotaxis to show how a coupling be- tween metabolism and behavior can affect evolutionary dynamics in a process we refer to as behavioral metabolution. This mutual influence between metabolism and behavior can function as an in-the-moment, intrinsic evaluation of the adaptive value of a novel situation – such as an encounter with a compound that activates new metabolic pathways. Our model demonstrates how changes to metabolic pathways can lead to improvement of behavioral strategies and conversely, how behavior can contribute to the exploration and fixation of new metabolic pathways. These examples indicate the potentially important role that the interplay between behavior and metabolism could have played in shaping adaptive evolution in early life and proto-life. 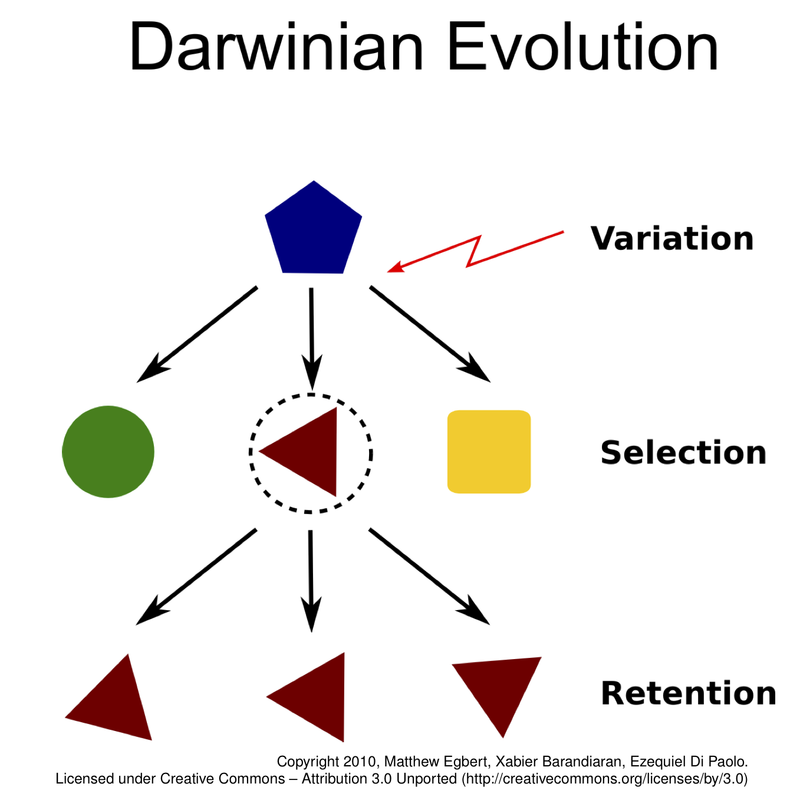 We argue that the processes illustrated by these models can be interpreted as an unorthodox instantiation of the principles of evolution by random variation and selective retention. We then discuss how the interaction between metabolism and behavior can facilitate evolution through (i) increasing exposure to environmental variation (ii) making more likely the fixation of some beneficial metabolic pathways, (iii) providing a mechanism for in-the-moment adaptation to changes in the environment and to changes in the organisation of the organism itself, and (iv) by generating conditions that are conducive to speciation. Egbert, M., Barandiaran, X. and Di Paolo, E. A. 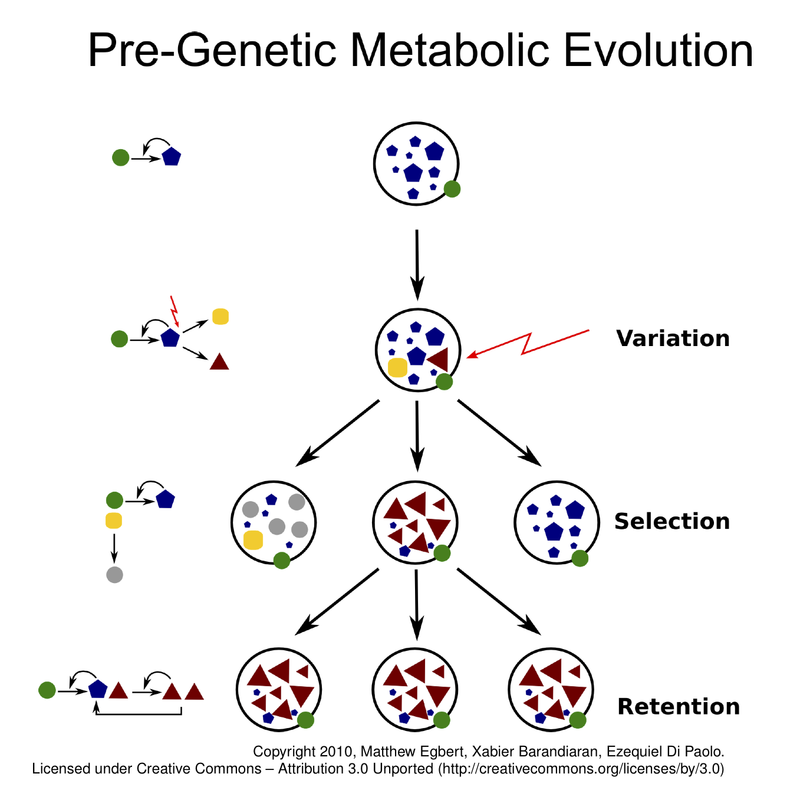 (2012) Behavioral Metabolution: The Adaptive and Evolutionary Potential of Metabolism-Based Chemotaxis, Artificial Life, 18:1, 1-25.